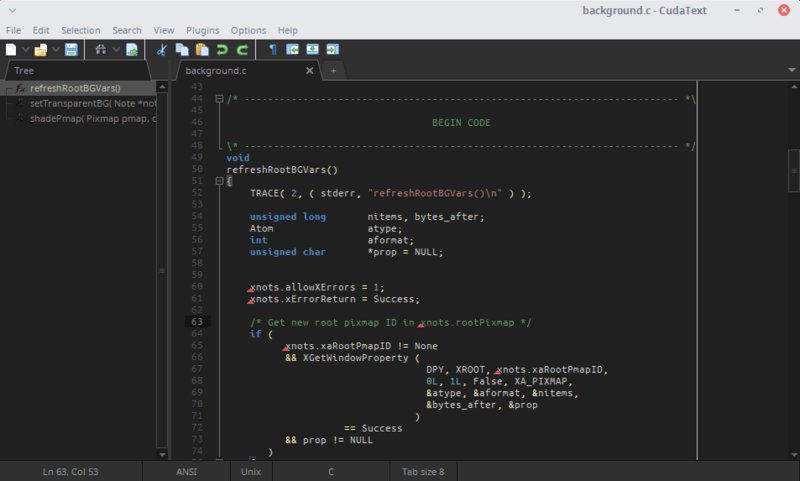 If you are looking for a lightweight code editor with a lot of perks, try CudaText. Despite its small footprint, CudaText comes with a lot of features you’ll find only in advanced code editors. A plugin based architecture makes the editor extensible with many more possibilities. CudaText is written in Lazarus. The Linux GUI is written using GTK2. While CudaText is perfect as an advanced code and text editor, it still lacks the features of a code browser like call graphs, which would add a lot of value. It seems it looks much like Sublime Text, which is odd, or like Atom. But it’s lighter than both. Given that it’s the most recent in the category, I wouldn’t be surprised if the devs reviewed the other utilities first and followed the GUI design.